Dancer in the Dark is not a good time at the movies. It’s what Hitchcock might have called a sink to sink picture where, after a hard day of cleaning dishes, a housewife goes to the cinema and sees a character cleaning dishes at the sink. 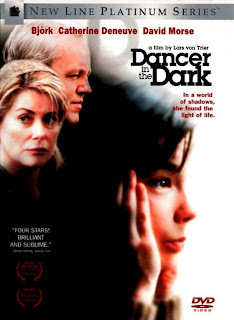 Except Dancer in the Dark takes part of its inspiration from Hollywood musicals, so the narrative is kind of soapy but overall grim, a hopeless tale of a blind young immigrant mother raising money for an operation that will spare her son from losing his sight. Director Lars von Trier has a knack for presenting mean-spirited downers that show elements of life we’d like to ignore. So while imperfect, Dancer in the Dark is as moving a film as they come, but the experience is not cathartic. Having seen it twice and with the time necessary to process the experience, the one thing I remember most is the performance by Björk. I’ve seldom seen a searing, open-nerved performance that can match it. Selma is a good natured and nervous mom, always willing to encourage her friends and pay compliments, and work overtime at several jobs. The year is 1964 and she and her son have come from Czechoslovakia because of what America promises, promises made in Hollywood musicals, a dream factory of promises that materialize only if you happen to live in the movies. But a dream can be so desired that what we know of reality, all that we can accept, can be pushed aside for seconds of bliss, the bliss of the dance floor, the bliss of a song. Selma escapes during moments of adversity, like when overtime at work becomes monotonous or when her sight is fading. Björk is something to behold—a singer by training, seldom appearing in front of a camera, she manages to do what few other actresses can. Perhaps because she had the courage to look the part. She’s not thin, not blonde, her breasts are not on display and her hair and makeup look natural, and in the visual medium that counts more than rehearsal time. It's more than looks. Icelandic by birth, she is convincing as a Czech immigrant. Her tears, panic, every emotion is epitomized. She conveys the world weariness appropriate having lived in a Soviet state. Then there is the singing. Dancer in the Dark is a musical. Selma’s daydreams take the form of colorful musical numbers. Björk’s voice is haunting. She sounds unlike any singer I can name, and her vocal chords seem to be tied to an ancient Icelandic tradition, an extreme folksy sound accenting her already natural folksy voice. She hits notes and holds them and she is impossible to ignore. If this film is her cinematic legacy, then so be it. The singer has said she will never make another movie. I suspect the pressures from von Trier, known for his volatile and demanding nature, may have had something to do with it, but perhaps Björk is best to quit while she is ahead. There is not a negative thing I can say; she delivers one of the most impressive performances in cinema history. It may not be a comprehensive critique but I am simply at a loss. If she indeed never makes another movie then she will not be overexposed. She is Selma and Selma is her. The same can be said of Renee Falconetti in Dreyer’s The Passion of Joan of Arc, and this is a very great comparison to make but Björk has earned it. She is quite simply riveting. The one thing that gets in the way of the material is the musical numbers. Björk, as I said, has a terrific voice and the songs in the film resonate. If these numbers were only sung the film might be closer to perfect but because Selma loves musicals, the numbers are all choreographed and staged in an embarrassingly clumsy fashion. I don’t know how von Trier could have accepted the final product. An anachronisms: the film is set in 64. Musicals at the time were very sophisticated and all took a page from Fred Astaire: dance in long shot. This way we can see the complexity of the body in motion, the skill of the choreographer. The Dogma 95 style that von Trier co-founded betrays the integrity of golden age musicals: oddly placed camera angles, quick cuts, extreme close-ups and cutaways work against von Trier’s intentions. A great embarrassment is the first musical number, “Cvalda”. Every problem I’ve mentioned is on lingering display, compounded by the fact that neither Björk nor Catherine Deneuve can dance. I understand the limited budget von Trier must have had, but at least rehearse with the lead actors prior to assembling the crew. Another problem the musical numbers have is color. I know this from personal experience trying to recreate Technicolor with digital film. Your first instinct is to saturate in post production. But Technicolor was a chemical process that had only a limited color range, so the trick to getting great color was with careful costuming and set design / decoration. Whatever colors you want in the final film need to be present on the set. Boosting saturation will only intensify ugly colors and make the image grainy, and that is just what happens in Dancer in the Dark. This is not a problem that ruins the film. Most of the dancing exists in one or two numbers and most of the songs simply have Björk singing, still however with the color problem. Another anachronism: the dance numbers are choreographed in a modern style. Hollywood musicals were more closely related to traditional dance techniques. There is a formal rigor severely lacking. Vincent Paterson is created with choreography and he should be embarrassed. His work does not come off well. One thing I can relate from when I saw this in a theater: some people were crying. The tears began with the first violent scene in the picture (I am being vague here because there are some horrifying story twists better to be discovered for yourselves, but you’ll know it when you see it). The tears were constant till the end. I understood how these people felt. The film is so heavy and depressing partly because Selma is such a giving person and so cruelly taken advantage of. You ache for this character, or at least I did, because when the stuff starts flying the audience and she knows she’s doomed. It is kind of cathartic in a way because we witness a woman accepting her fate and happy to sacrifice for her son. The credit goes to Lars von Trier for developing such an inescapable story and for telling it with such sensitive grandiosity. In the finale, when Deneuve’s character runs up the stairs to Selma (again, being vague) we know that she never would have been allowed to do that or stay as long as she does, but in the tradition of Hollywood storytelling implausibility because the norm. It’s more satisfying that way. One thing I did not appreciate in the film is the obvious but slight attacks on America. Von Trier is known for his severe opinions about our country but I took offense to scenes linking a murder with a middleclass family’s home and the American flag. Arrogant Americans verbally attack Selma because of her communist country roots, and overall the film paints a less than savory image of average American life. Any country has faults because people are not perfect. Perhaps America cannot always (or perhaps seldom does) live up to its ideals but this is, all things considered, a great country and for von Trier to attack it without ever stepping foot in it is bothersome. So too are the numerous Scandinavian actors faking American accents. The artifice of von Trier’s film shows most with these actors. The question I ask though is that if an American filmmaker made the same script would I signal out the anti-Americanism? Probably not. Because all that von Trier criticizes is at times accurate, an American filmmaker would be let off the hook, but for those who love this country it is still disturbing to watch. But von Trier is known for his controversy. Antichrist is proof of that. What von Trier has that few living filmmakers have is nerve. This man is an artist with vision, and that he can offend people is to him a great asset. 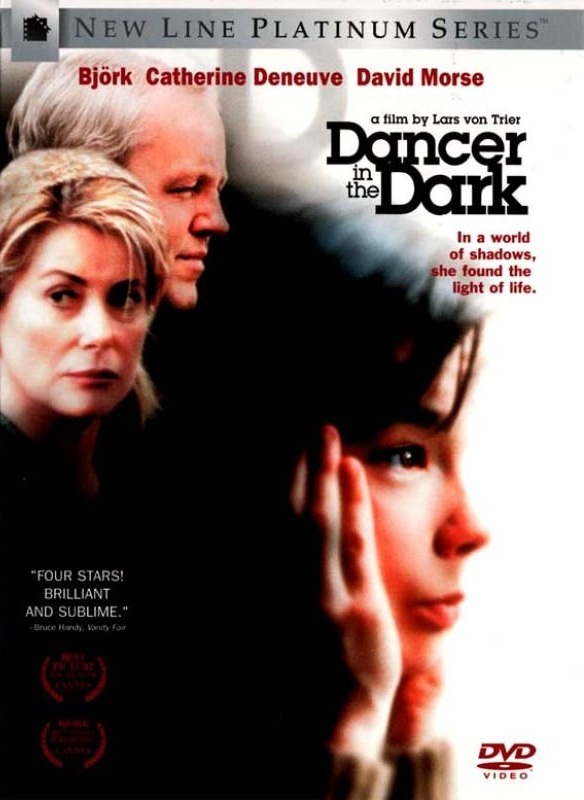 Dancer in the Dark is a film that many will not like and some will appreciate. Its mood will appeal only to a few, like me, who can rightly claim to love depressing films. It is powerful with a terrific lead performance by Björk and a lot of balls. Thanks! You're the first person to comment on my blog. I've never maintained any kind of website before so I don't know if this is the best way to reply. Regardless, it's good to know people are seeing this. Dancer in the Dark is a great film. I saw it on the big screen at the Brattle Theater in Cambridge, MA as part of a Catherine Deneuve retrospective. I've never seen a movie with an audience that had such a palpable effect. Antichrist may have been horrible but von Trier is a great director.